Below is the Amazing Diet I followed when I was diagnosed. 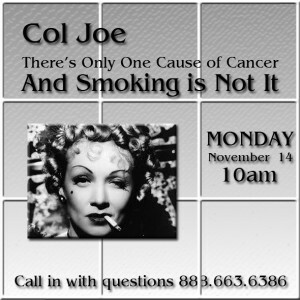 Colonel Joe joined us this morning to discuss his research into what causes cancer and how it can easily be cured. This fiesty and fun older gentleman has been around the sun more than most of all of us without having been pumped with vaccines and other pharmaceuticals, taking supplements, etc. 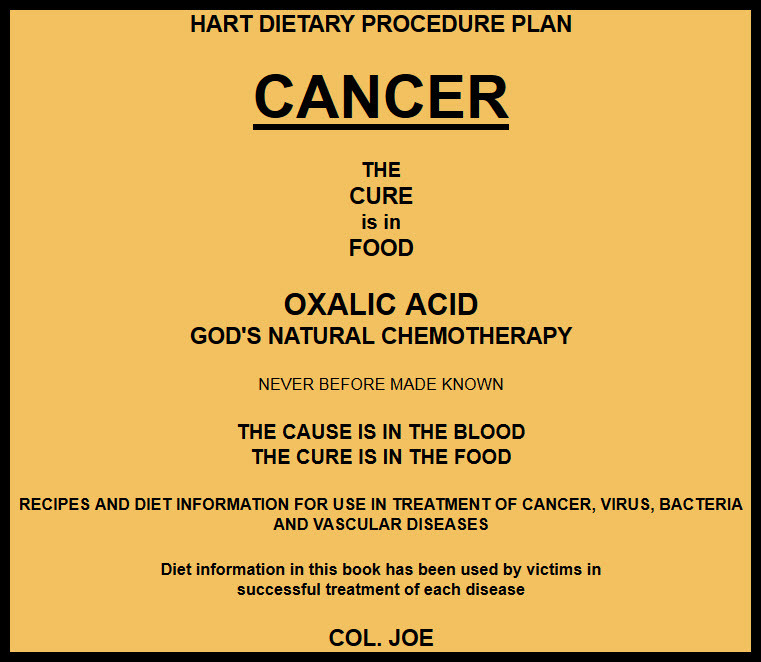 So as we say around here ”the proof is in the pudding.” Colonel Joe suggests that the number one cause of cancer is citric acid, then goes on to list 4 more things to absolutely stay away from. He then goes on to explain Oxalic acid, Gods chemotherapy, as he describes it, and by adding foods to the diet high in oxalates, without overdoing it, can easily cure disease. It seems so simple, but very sensible. Using dark chocolate vs. chemotherapy? Col Joe's "Hart Dietary Procedure Plan"
He really wanted to capture the attention of any one would listen to him and tried to get it to the people who can make a difference. He was there for me whenever I called him..working all hours of the night trying to help others. I personally knew Col Joe....his dedication to his work and people will be missed....You do not meet people like him very often. Francis Joseph Hart, aka Colonel Joe, 93, of Pea Ridge passed away peacefully at home on May 23rd. He was well known around the area for his strong opinions and his frequent contributions on local radio, particularly about topics related to government activities and his patented "Harts Dietary Procedure". A decorated war hero, Colonel Joe, enlisted in the military during WWII as a minor; beginning his career as a mechanic and working his way up through the ranks and becoming a B17 Bomber pilot. He flew 29 missions over Germany and was shot down on his final mission. He spent a year in a Nazi Prisoner of War camp. In January of 1945, he left the camp on foot as part of the infamous Death March in the midst of one of the worst blizzards in history. During the course of the expedition, he aided fellow American soldiers as well as the Nazi guards as many succumbed to the affects of the weather and the dysentery that plagued so many. 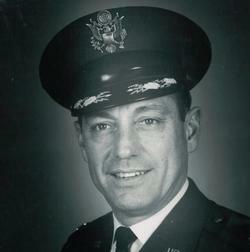 Colonel Joe received many awards and commendations during his illustrious career including the Purple Heart, the Distinguished Flying Cross, the Air Force Commendation Medal, the Air Medal with Leaf Clusters, and several others. After the war he became a test pilot for Boeing in Tulsa, Oklahoma, certifying new planes for delivery to the Air Force, including the B47 Strategic Jet Bomber. He then went on to work on quality control for the Titan ICBM launch sites. After retiring from the military; he worked for Martin Marietta in Denver, Colorado where he was a Quality Control coordinator for the Lunar Lander. Upon retirement, he moved to Pea Ridge where he began a quest to determine the cause of the untimely death of his beloved poodle. After a significant amount of research, he learned that the dog's death was likely due to a dietary phenomenon. His research also led led him to the discovery of a chemical in plants that he believed to have natural chemotherapeutic properties. He applied and received three patents for the chemical as a cancer fighting agent, about which he wrote the book, "Harts Dietary Procedure". Throughout his retirement, he was always going out of his way to help others with no expectation for recognition or anything in return. He was preceded in death by his parents, Lewis D Hart and Minnie B. Bauch; two brothers and three sisters. Colonel Joe is survived by his two sons, Mike Hart of Cypress, Texas, Pat (Sheri) Hart of El Centro, California; a daughter, Toni (Ron) Isliefson of Lakeview, Minnesota and a granddaughter Krystal Marie.